It’s “back to school” for many children in our area today. Being from a rural community, school rarely starts until after Labor Day. 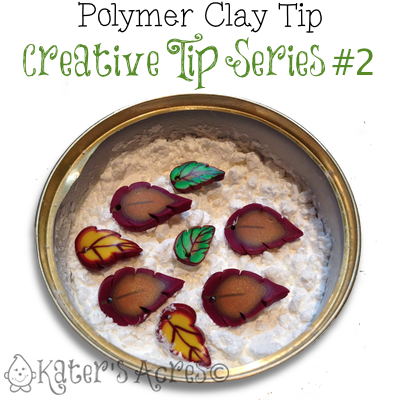 So, since everyone is going back to school, how about a polymer clay tip to get us started! This past WIP Wednesday I mentioned a little trick that I use to keep my beads (especially flat caned beads like the ones above) holding their shape during the baking process. We all have things that we do in our studio to “help” us in our creativity. Although I am not primarily a jewelry designer, but rather a sculptor, that doesn’t mean that I don’t make jewelry or don’t at least make jewelry components. Sometimes we have projects that we need to retain their shape during the baking process. If you are new to claying you may not know that as clay bakes it tends to slump while baking. I use this term loosely … it doesn’t slump like glass does in a kiln, but it does tend to give a little, especially when it comes to larger, figurine style pieces. Many of my figurines I have to prop with glasses or foil to keep their shape while they bake. I tend to make a lot of beads from leaf & flower cane slices that I have made. The necklace at the right is an example of one of those that I made recently (you can get the tutorial here). When it comes to canes, slicing them, and baking them, my personal preference is to give them a little twist or a little bend. If I would just place them on my tile in the oven, they might flatten and lose their shape a little. A much used trick by polymer artists is to place your items in a bed of cornstarch. (I do not know where this idea originated or who thought of it first.) You can make your own using things you already have in your house. Keep in mind that your container must be oven safe. To make mine, I have used an old kitty food container (yeah for kitties, see Smokie here) filled with cornstarch. When I have a small item that I want to manipulate and keep its shape during baking, I simply pop it into the container. This helps to keep the shape of our piece by giving support to the underside to allow it to retain its shape. DISCLAIMER: If you decide to try this trick. Please know that you must scrub your beads or cane slices with a soft toothbrush to remove all the cornstarch from the nooks & crannies of your items. An added tip for the kitty container is to protect the cornstarch from spills or getting stuff in it between uses with a can lid You can get a plastic (rubber?) one very cheaply at almost any store and often they come in a two or three pack. That’s a great tip, thanks Lisa! I’ve tried the cornstarch trick and really like it. But for pieces that I want to be really flat (I use ceramic tiles) , after baking while they are cooling, I place another ceramic tile upside down on top of them with parchment paper in between them. This is something you can share with your readers. Thanks Luann! I’ve done the same thing for years, I read it in a book I have around here somewhere. It works well doesn’t it? !